Hate speech, like art or obscenity, often is in the mind of the beholder. To my mind, Alex Jones’ qualifies, and not just because I hate it. But because it is an insidious form of hate speech that skirts the line of explicit, imminent threats in favor of longer-term and more underlying ones. He may not have outwardly advocated to incite violence toward any groups or individuals, but he routinely incites groups and individuals in a way that undermines the security of others, often the victims of actual violence. His “false flag” attacks on the Sandy Hook and Parkland school shootings don’t just pour salt into sensitive wounds, they desensitize society from taking actions that would create laws, policies and social norms to prevent them from happening again. As the name of his “show” honestly states, he is conducting “InfoWars” on our sensibilities. And the only sensible thing to do in response, is to ignore and marginalize what he does. The worst part of the current debate over whether and which platforms should ban his content is that it is giving Jones more attention than he should have. Fringe conspiracy media mongers have always existed, and the First Amendment protects their right to publish as long as it isn’t explicit hate speech or incites violence. However, it does not protect his right to be distributed by commercial media platforms -- especially big digital “social media” ones that have amplified his voice, expanded his audience and helped disrupt our common sense. Kudos to Apple, Facebook and Google/YouTube for exercising some sense. While they have not explicitly banned Jones’ “Info Wars,” they have taken responsibility for censoring segments that step over the line. Twitter, once again, is acquiescent, asserting its principle for being an open platform for social discourse, even when it’s so off course that it undermines the society it’s supposed to serve. “We know that’s hard for many but the reason is simple: he hasn’t violated our rules,” Twitter CEO @jack Dorsey tweeted Tuesday in defense of its decision. Actually, I know that’s not true, because Twitter does not have a single standard for moderating accounts. I know this because a while back, I made a case for suspending @realDonaldTrump, at least while he is @POTUS, since his tweets are so powerfully disruptive that they incite violence and inflict pain on both groups and individuals. Twitter never responded to me, but shortly after, it stated it has a separate policy for treating the accounts of “world leaders.” In response to that, I asked what Twitter’s policy was for defining who is a “world leader.” Again, there was no response. 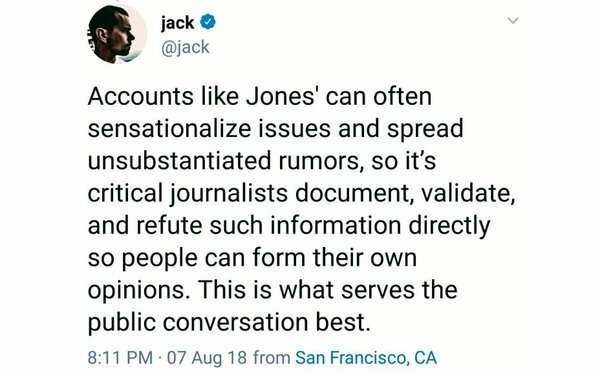 “Accounts like Jones’ can often sensationalize issues and spread unsubstantiated rumors, so it’s critical that journalists document, validate and refute such information directly so people can form their own opinions,” @jack goes on to tweet in his string, passing the buck to others to set the record straight. “This is what serves the public conversation best,” he concludes, then posts a link to Twitter’s ridiculously long, terse and incredibly subjective “The Twitter Rules,” which is ironically subtitled, “A Living Document.” You can read them in their entirety below. If you ask me, @jack’s living in the past and hiding behind old Silicon Valley rules that no longer apply. The idea that digital media platforms are dumb intermediaries for end-to-end users no longer applies. At a time when more Americans get their information -- real news, fake news and the information war-mongering kind -- from social media than they do from traditional, regulated media like TV, radio and newspapers, it’s time to rethink their role and their responsibility as gatekeepers. Otherwise, we should throw away their keys. We consider graphic violence to be any form of gory media related to death, serious injury, violence, or surgical procedures. We consider adult content to be any media that is pornographic and/or may be intended to cause sexual arousal. Learn more about our media policy. Twitter allows some forms of graphic violence and/or adult content in Tweets marked as containing sensitive media. However, you may not use such content in your profile or header images. Additionally, Twitter may sometimes require you to remove excessively graphic violence out of respect for the deceased and their families if we receive a request from their family or an authorized representative. Learn more about how to make such a request, and how to mark your media as sensitive. Intimate media: You may not post or share intimate photos or videos of someone that were produced or distributed without their consent. Read more about intimate media on Twitter. Please see our support articles on following rules and best practices and automation rules and best practices for more detailed information about how the Rules apply to those particular account behaviors. Accounts created to replace suspended accounts may be permanently suspended. 4 comments about "What Serves The Public Conversation Best". pj bednarski from MediaPost.com, August 8, 2018 at 9:58 a.m.
Joe, it seems to me volume creates/allows social media to avoid responsibility. There's so much posted to YouTube and Facebook, they at best they have had a "stop it once it already happened" policy, something like Nancy Pelosi's distorted quote, "We have to pass the bill so that you can find out what is in it" re Obamacare. Broadcasters, I guess, still fear regulation and that keeps really offensive stuff off TV, and they're dying. Cable with no regulation except the marketplace that can lead to real disconnects, pushes boundaries. But the Internet has until now celebrated its lack of judgment or accountability, fortified by just how much gets put up there. There's no accounting for taste. That's how lots of digital entrepreneurs got rich. Joe Mandese from MediaPost, August 8, 2018 at 10:04 a.m.
PJ, Totally agree, but it's no excuse. Digital media platforms make piles of money (from advertisers and market capitalization) and have an obligation to be socially responsible. If they're not, they should be regulated like traditional media before. Broadcasters, as you note, have a regulatory compact. Cable operators are accountable to their subscribers and to the local municipalities that license them (which explains the difference in local public access programming in NYC vs. other markets). Platforms need to step up the game as responsible gatekeepers or they need to be regulated. It's there's to lose. Ed Papazian from Media Dynamics Inc, August 8, 2018 at 12:58 p.m.
Pj and Joe, I agree and it seems to me that digital players such as Twitter, FB, etc. are simply begging the Feds to intervene because they do not take bolder and more widely acceptable steps to moderate---or remove---offensive and anti-social behavior on their platforms. Couple this with the vexing privacy issue as well as "errors" in data reporting and it may not be long before the Feds make a move. Paula Lynn from Who Else Unlimited, August 8, 2018 at 6:35 p.m.
Publishers. They are publishers. Except when THEY don't want to be. THEY ARE publishers and must be held to the publishing fire by using editors for every thing they publish just like print and broadcast. And yes, the world would be a much better place and maybe even allow it to survive without the Twits and its motherload.